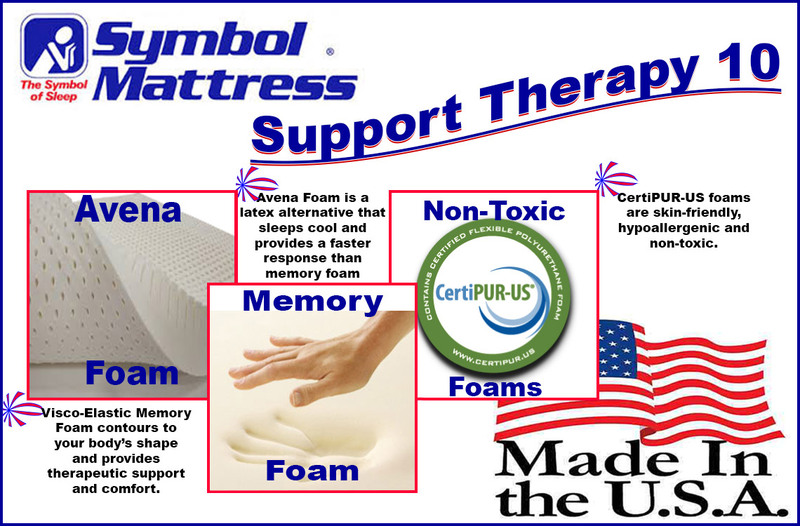 The "Support Therapy 10" features a breakthrough material in the sleep product industry; Avena™ Foam. Being the only material that surpasses latex foam when it comes to durability, this is an American-Made mattress that is built to last! The "Support Therapy 10" also contains a layer of high-quality visco-elastic memory foam. Between those top two layers, you're getting the contouring benefits of memory foam, with the faster-response and cooling properties of Avena™ Foam. That means that you won't experience the 'stuck' feeling that some dislike about memory foam and your sleep won't be interrupted by your bed absorbing your body heat. 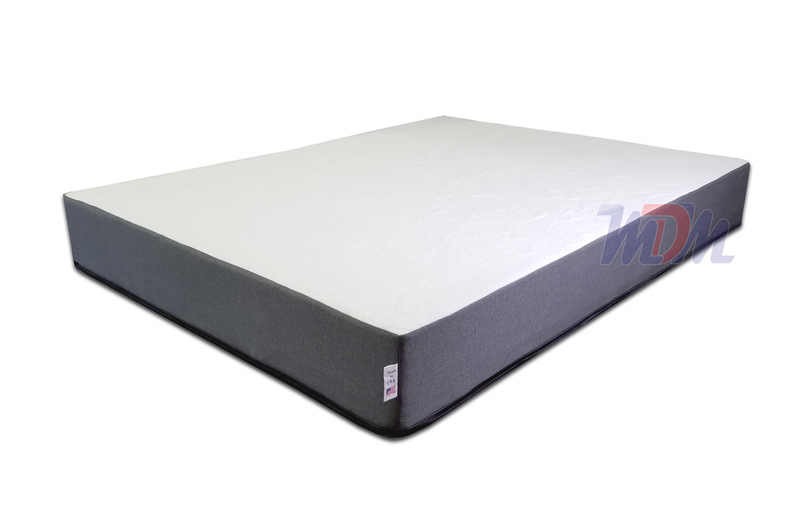 The four-layer makeup of this mattress model ensures a dependable product and, reflects pride in the bed's engineering. The "Support Therapy 10" is perfect for adjustable bed bases or any kind of foundation. This is a firmer-feeling mattress with a smooth cover that stands alone in ingenuity and exclusivity. Unfortunately, when you've been around mattresses as long as I have, you see a lot of the same stuff. Most models only have slight differences in foam layers and things like that. That is why I felt a high level of excitement come over me when I tried out the "Support Therapy 10" by Symbol Mattress! The Support Therapy 10 contains the trademarked and relatively new Avena™ Foam, which has a very different feel from anything that I've experienced. It is similar to the feel of latex but, it's simply more comfortable. Somewhere in between the feels of a high quality gel-infused memory foam and latex foam is Avena™. Considered an "alternative to latex", I consider it an improvement to latex. In blind tests - no matter the previous preferences of the individuals - shoppers tend to prefer the feel of memory foam over the feel of latex foam. 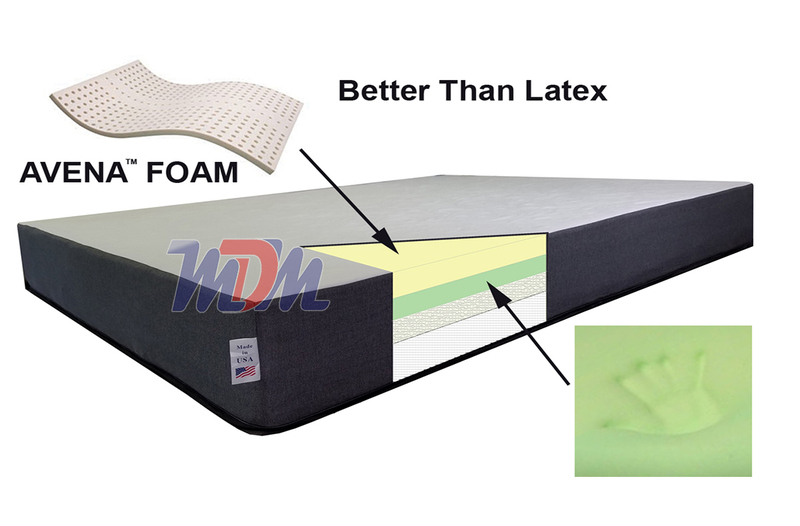 However, some really insist on purchasing latex because it's more durable and cooler than traditional memory foam. Well, Avena™ has even more durability than memory both memory foam and latex and, it's cooler than memory foam and as cool, or cooler than latex. It's truly a breakthrough in sleep product industry. The Support Therapy 10 doesn't 'sink' quite like a memory foam. It has a fast response (bounce-back) quality that's a little less than the 'immediate' response of latex. (this is due to the Avena™ foam layer at its top). The layer just beneath is visco-elastic memory foam; this layer provides to you a body-contouring, supportive feel. Additionally - before the high density support core - is a 1 1/2" Support Layer. This buildup of layers seems to be ideal for both durability and comfort. Many people have allergies to latex but would like to enjoy a mattress with its benefits. Well, this mattress is made from 100% recyclable materials, all of its foams are CertiPUR-US certified, it sleeps cool, it is hypo-allergenic, it's even more durable than a latex mattress, it's more affordable than latex and cheaper than comparable memory foam options, it has less compression over time and, it's made in the USA! From what I've seen and tried, that makes the Support Therapy more than an alternative; it's an improvement! I recommend this mattress to anyone looking for a cooler, firm and long-lasting bed. It also works great with adjustable bed bases. Its value is unparalled so, if you like firmness and lasting support but like a faster response in foam than you can get from a memory foam mattress, this one is for you!